I read a lot of books. I mean, a whole lot. Not as many as some people, but still, a lot. Most of the books I read are really good (I usually don't get through the ones that bore me, as there is nothing I like less than a book that I find uninteresting), but I'd like to say that I'm not too easily impressed. Maybe that's not entirely true, but whatever. What I want to say right now, is that I was extremely impressed by "When You Reach Me." It's rare that I want to read a book as badly as I wanted this one, and it's even rarer that a book I want that much exceeds my expectations. I could tell you right now what to expect out of this book, but I have a feeling that just giving you a brief description of what happens in it wouldn't do it justice. There's a whole lot going on here that isn't even mentioned on the jacket flap, and spoiling any of it would be cruel. It really is amazing that the book has so many different ideas, yet it doesn't get overstuffed (indeed, the book is around 200 pages and not a word is wasted). Other authors would pick one idea and stick with it; Rebecca Stead juggles it all, and it looks effortless coming from her. There are a boatload of characters, and each one is unique and memorable. Miranda, the protagonist, is a very likable girl, easy to relate to in many ways. She goes through a lot of the typical twelve-year-old girl stuff, but remains interesting, intelligent, and genuine throughout. All the other kids are unique as well; Sal, Annemarie, Colin, Julia, Marcus, take your pick. (Yes, I think even Alice was more dimensional than the average side character in a middle-grade novel.) They're all distinct and richly characterized, and the way they all link together is twisty and fascinating. The adult characters don't get a lot of screen (page?) time, but the same applies to them. The colorful cast of characters alone would be impressive, but there's also that little "time travel" thing going on. I read "A Wrinkle in Time" shortly before reading this book, as I was told it would benefit me (there are a lot of references to it in the story, but I wouldn't say it's necessary to read it first), so I think that might explain why I didn't really find the back-and-forth-in-time thing to be confusing. I doubt other kids will, either. Anywho, I'm not sure if the time travel has loopholes in it or not, nor do I care to find out. The important thing is, when everything comes together in the end, it all makes sense. Pay attention to every last detail in the story; they all matter. I wouldn't really count this as historical fiction; though it's set in 1979, it feels like it could work no matter what decade it is. A few details would have to be changed, but whatever, the story feels timeless. The details of the decade, however small and unobtrusive they are, feel truthful, and not the "That '70s Show" version of history. Honestly, though, if the book was like that, I still wouldn't have minded it considering the near-perfection of everything else in there. So, what else can be said about this book that hasn't been said? It's remarkable. I don't say that about a lot of books. (Okay, maybe I say that about books that I talk about in long, sprawling reviews like this, but I wouldn't write so much about them if I didn't like them so much.) It is very, very deserving of awards recognition come January 18th. I will be rooting for it, as I have read most of its competitors and, though I liked them, they don't compare. 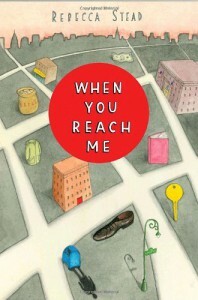 This is really something else, and no matter what kind of book you like, "When You Reach Me" is perfect for you. Trust me on that one. EDIT: It got the Newbery.